I didn’t know how to react to Mockingjay – Part 1. I remember feeling strangely ambivalent. I was entirely unmoved for the two hours I spent in the theater. After thinking about the film for a week or so, I realize that I felt cheated. This is because Mockingjay, Part 1 isn’t a movie; it’s a glorified advertisement for a better-funded, and hopefully better-made, final installment. There’s a scene towards the last act that hammers this home. Katniss (Jennifer Lawrence) has cooperated with District 13’s President Coin (Julianne Moore) to produce an anti-Capitol ad campaign. In the underground district’s makeshift town hall, Coin presents the latest of these clips. We then see that the in-universe propaganda has adopted both the font and logo from the movie’s actual promotional materials. For a moment, this choice gives the film an interesting metafictional twist. Looking back, it strikes me instead as a simple embodiment of the movie’s superficiality. The film is too lazy to use unique graphic art in-universe, just as it is too deflated to work as a compelling standalone cinematic chapter. 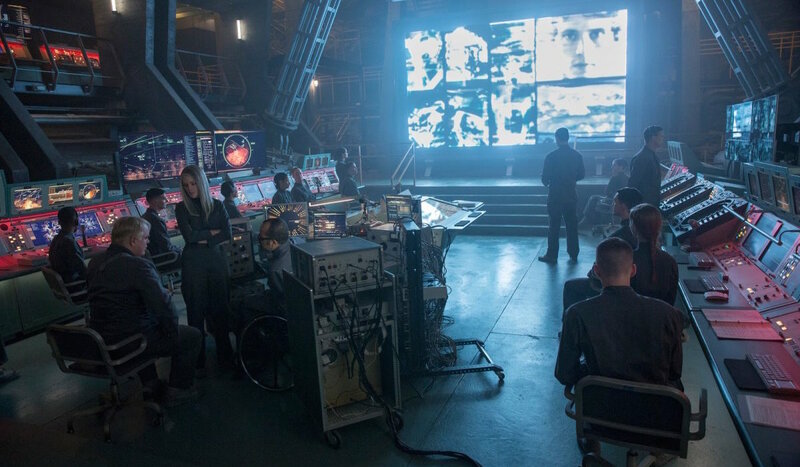 That isn’t to say that Mockingjay – Part 1 is devoid of depth. On the contrary, the film offers an overt depiction of the power of media and its influence on – and alongside – politics. President Snow (Donald Sutherland) spouts fluffed-up lies about the Capitol’s benevolence and the necessity for utmost cooperation from all citizens of Panem. 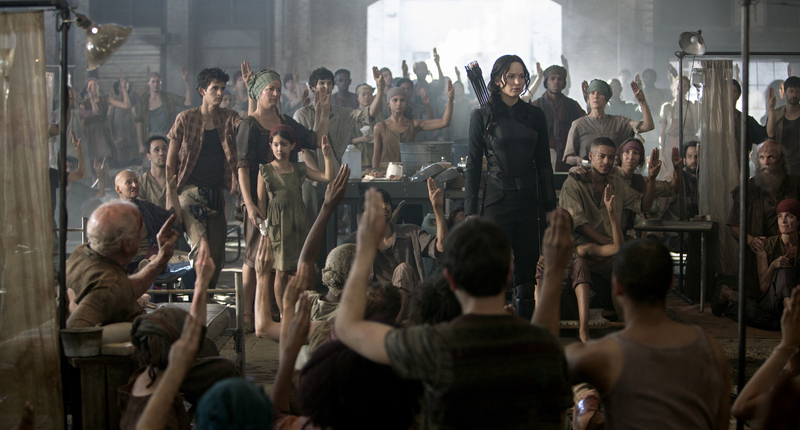 Both the audience and the rebellious districts can see straight through the ruse; the Capitol’s push for peace is nothing more than an effort to sustain its own dominance. Yet Snow’s glossy iron fist still threatens to squelch the truth, paralyzing defectors. The film explicitly shows that de facto power uses fear to destroy any chance of progress toward justice . Malevolent figureheads at the top of the political food chain feast on the blood of the disenfranchised, literalized here in a discussion of Snow’s sore-filled mouth. Meanwhile, Coin and former Head Gamemaker Plutarch Heavensbee (Philip Seymour Hoffman) team up for their own propaganda shorts (dubbed “Propos”) to give the rebels courage to act. It’s an effective approach and Katniss’ off-the-cuff catchphrases quickly go viral, demonstrating the media’s potential for spreading both good and evil. There’s a great sequence that shows her folk song, “The Hanging Tree,” passing in and out of diegesis. First we see her sing as Propo-director Cressida (Natalie Dormer) records, then the song overlays a montage of rebellion in District 13 and finally re-emerges as the soundtrack for a new propaganda short. An organic moment becomes a Propo becomes action. Tensions rise and we’re told war is about to explode. The problem is that we never see it happen. It’s obvious that Lionsgate decided to split Suzanne Collins’ trilogy capper into two films in order to squeeze as much money as possible from ticket sales. I just wish it wasn’t so obvious. Director Francis Lawrence, who so brilliantly improved upon the source with his adaptation of Catching Fire, fails to replicate his success in his interpretation of the final novel. Instead, he strictly adheres to the boring, gloomy slog that also troubled Collins’ writing. Katniss spends the first half of the novel alternating between moping in District 13 and filming Mockingjay messages. Lawrence traps the entire film in that same cycle. Perhaps that’s why the film is so strange to watch. It lacks a true climax. Yes, the stakes are heightened in the third act, but the film never made me feel the pressure of impending conflict. That’s a shame, since this story is by far the most intense in Collins’ series. 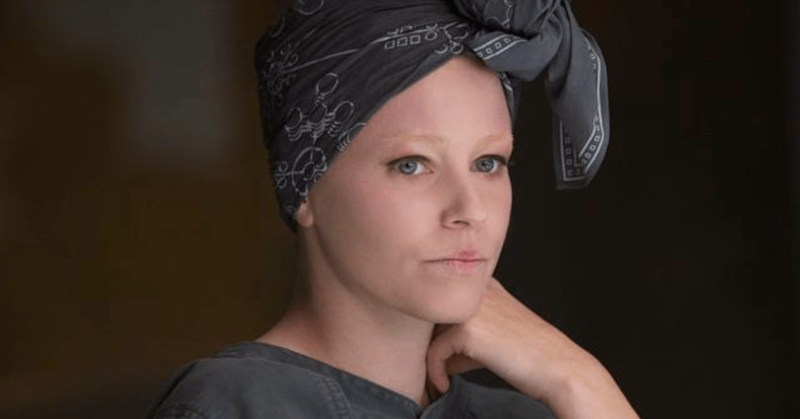 What Mockingjay – Part 1 loses in plot it gains in emotional depth. In particular, the film offers a glimpse into the shell-shocked psyches of the surviving victors. In the film’s introduction, Finnick (Sam Claflin) tells Katniss that he wishes they had died in the games. His voice sounds detached and hollow. He stares blankly ahead as he speaks. Then the title card slams onscreen. The moment is chilling. Later, footage of an increasingly disheveled Peeta (Josh Hutcherson) reminds the audience, and Katniss, just how hellish life is under Capitol rule. Jennifer Lawrence remains the leading force of empathy that she was in The Hunger Games and Catching Fire. She balances Katniss’ fiery resolve with her growing feeling of despair. As Moore’s President Coin states, “the Games destroyed her.” Katniss’ pain reveals itself beneath her outward determination. Lawrence makes the character more than the revolution’s Mockingjay; she captures the nuances of a person struggling to become a symbol. The film embraces the heroine’s troubled headspace from the opening scene. Affecting turns from Hoffman, Elizabeth Banks and Woody Harrelson support Lawrence’s lead. As Plutarch, Effie Trinket and Haymitch (respectively), these returning players reflect Katniss’ burden with their own. Their scenes are tinged with a world-weary melancholy, but the cast enlivens those dreary beats. But it’s not enough. I couldn’t help but think of Harry Potter and the Deathly Hallows: Part 1. The first half of David Yates’ adaptation of Rowling’s series-ender is essentially a setup for the Battle for Hogwarts in Part 2. Yet the director digs the tension out of Harry, Hermione and Ron’s quest for Horcruxes, and finds real danger by throwing the trio into the big, bad world. Unfortunately, both Suzanne Collins and Francis Lawrence keep their protagonist sequestered and, in so doing, kill her intrigue. Both Deathly Hallows and Mockingjay have conflict throughout their original texts. But unlike Yates, Lawrence uses his first act to pay mere lip service to the risk of all-out war. His adaptation hews too closely to its source. Rather than truncate the buildup in District 13 and end the film amidst the chaos of battle, he plays it safe. 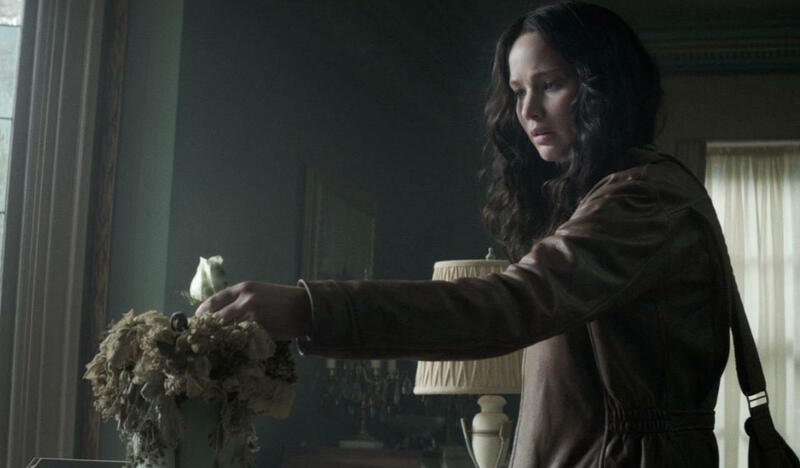 This makes Mockingjay – Part 1 a damnably flat tease of the approaching storm. 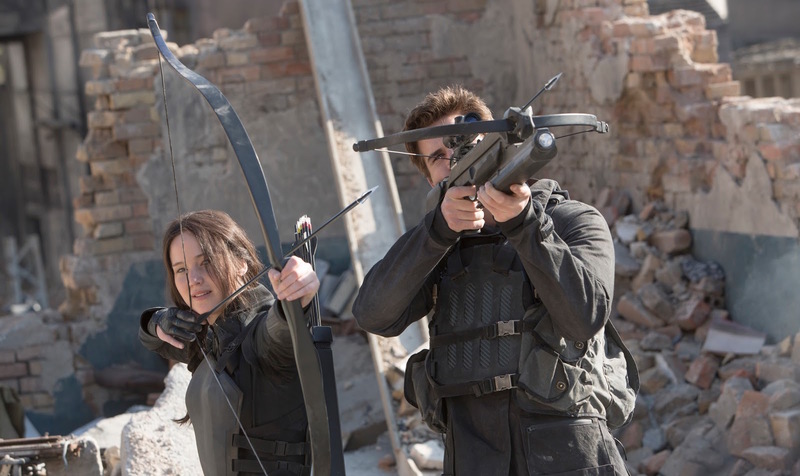 By leaving the major action for the second film, it seems Lionsgate has written itself a fat check. The evidently low financial backing for this film will certainly ensure a revolutionary return for the final film. I hope that Lawrence is allowed more creative control for Part 2. The director, after all, has one last chance to end the franchise on the right note. This time around, his film is buoyed by the strength of its cast – but it broods where it should burst.